You finally have that open concept home that you’ve always wanted! So, what are the decorating tricks and secrets? These designs are becoming more and more common across many regions of the country. From Georgia to Texas to California, this design concept appears here to stay. From this spot in my home, you can see down the entry hall, into the dining room, the kitchen, the breakfast nook, the living room, into the master bedroom, and finally the back patio. Decorating decisions I make in any of these areas can affect the others. That is a lot to consider! It can be challenging to find a way to define each space while blending them visually. Today, I hope to help you with some guidelines which I’ve found to be quite helpful. I am always careful to use coordinating color schemes. 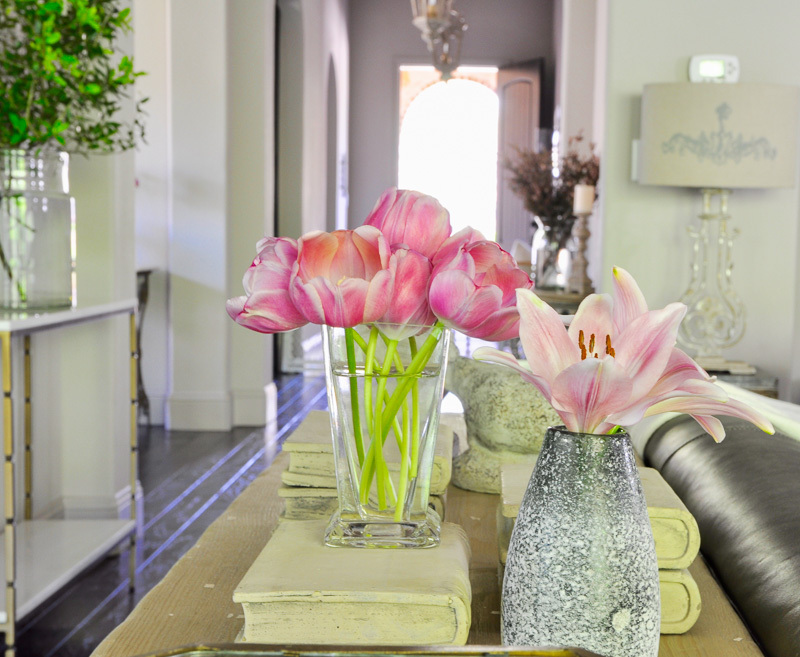 The same light taupe paint is prominent throughout our entire home. We decided on flat paint for the walls and a satin finish for the trim. Also, we purchased sand colored linen fabric for furniture in the living room, breakfast room, and dining room. Due to lack of visual boundaries, it is important to remember to keep a consistent style throughout the space. This is a good rule of thumb as it applies to finishes, furnishings, and accessories. You don’t need to match everything, but just remember that choices you make for one room could be viewable from several other vantage points. My husband has been on the sales side of real estate for nearly twenty years. 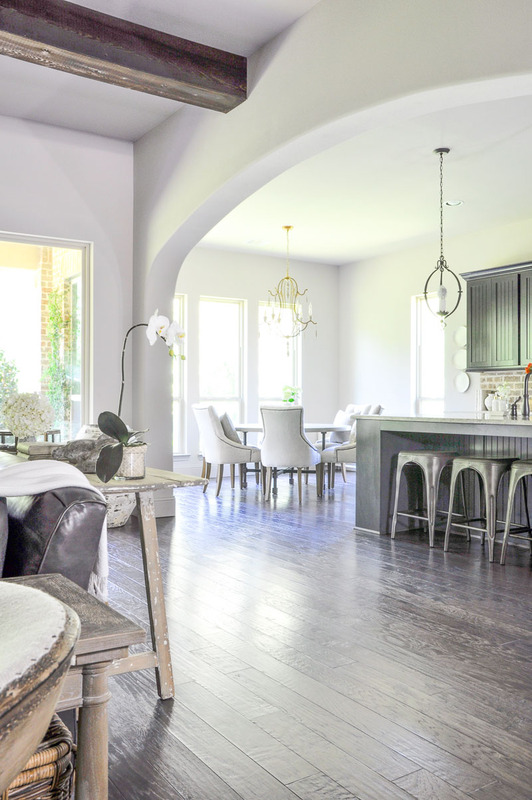 There is one simple rule I always see him stick to when making selections for an inventory home: use one flooring type throughout the home’s main areas. He is a quick learner! Whenever possible, if there is not a door or distinctive transition space between rooms, you will want to keep your flooring consistent. Not only will it flow better, but the space will feel larger too. These open design concepts require some creativity when it comes to defining one area from the next. One obvious means of doing so is to do it with furniture. For example, a sofa not only becomes a bit more dressed up with a console table or buffet placed behind it, but the transition from that space to the next is clear. Furniture can also help distinguish functionality from one room to another in an open concept home. 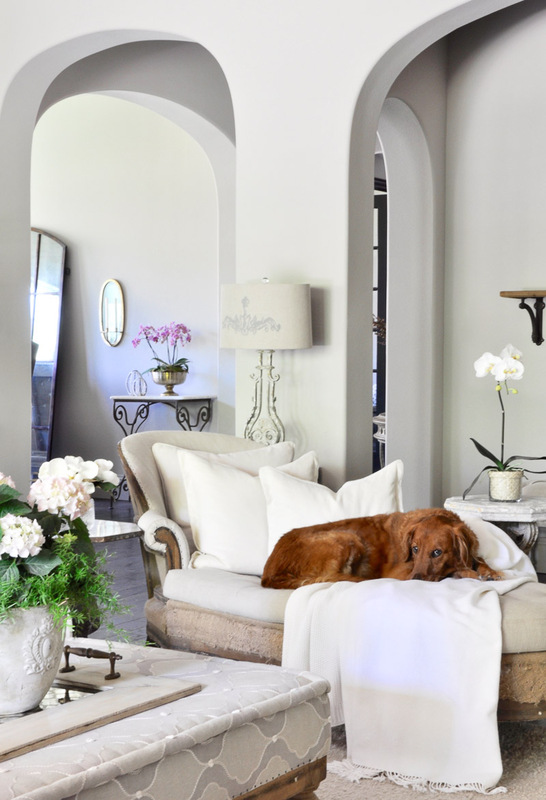 Additionally, the back of the sofa makes a great “wall” by creating a border in an open space. Another great way to define an area is with lighting. A chandelier above a table or pendant lights above an island create an area of intimacy. Also, our chandelier is centered in the living room and the rug is centered underneath it. You can learn about making lighting selections here. Perhaps you prefer to define the space with an area rug? That’s a great choice as they work wonderfully in this capacity. Think of how the red carpet is used at award shows. Do the celebrities often step off the carpet? No, because this carpet defines the space: a hallway with invisible walls. Similarly, a properly sized rug can define a smaller area within the open space of your home. One of the easiest ways to bring focus to a space’s boundaries is by floating the furniture within it. By doing so, you will create a visual focal point. And hope your dog doesn’t take it! Around here, without fail, when I create a cozy spot, my pets are going to seek it out! They are the best judges of success. So, when you head to your favorite chair, chaise or spot on the sofa and you find your pet there, go ahead and pat yourself on the back for a job well done. Finally, it is very important to consider the visual impact of adjacent rooms. For example, you can see that the color on the vent hood is similar to the wall paint. 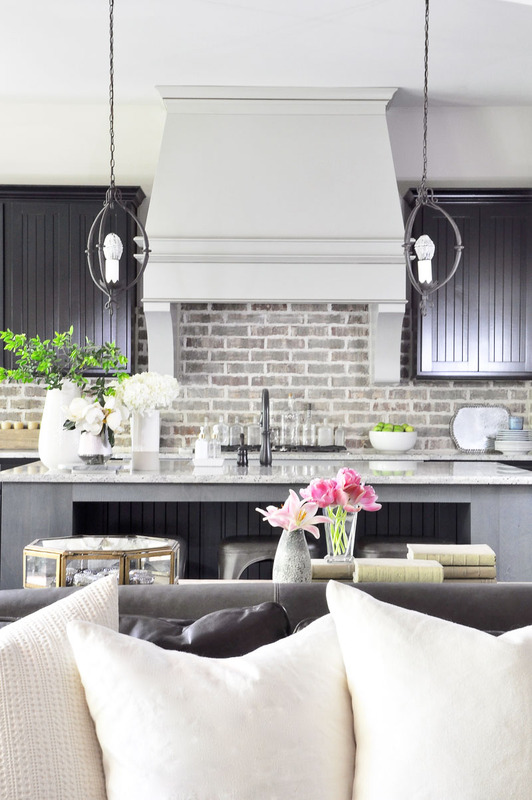 Also, the brick backsplash works seamlessly with the leather sofa. All of these colors not only work together, but also create a symmetry and balance for the kitchen, great room, and the furniture pieces throughout. Designing with an open concept floor plan does create a few challenges. But, by creating borders, focusing on the continuous use of color, and ensuring that the design concept is carried throughout the open spaces within the home, decorating and designing an open concept home should be quite fun! If you would like to stay update to date with the latest on Decor Gold Designs, please click here to subscribe to our newsletter. 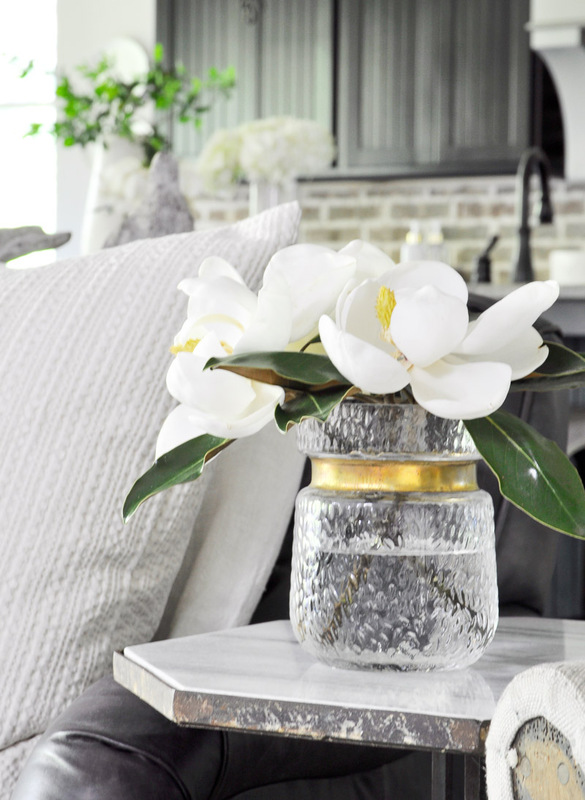 Also, for additional decorating tips, you may enjoy reading How To Add Accessories To Your Home, 4 Tips To Help you Redecorate, and How To Decorate With Mirrors. You can also find links to full tours for each of the rooms shown above here. Thank you for visiting Decor Gold Designs and designing an open concept floor plan. Thank you, Jennifer for sharing your beautiful home! We arè moving into our new open concept home this weekend. I feel like this post was written for me, since I have been stressing over how to decorate it. Your advice is very helpful! 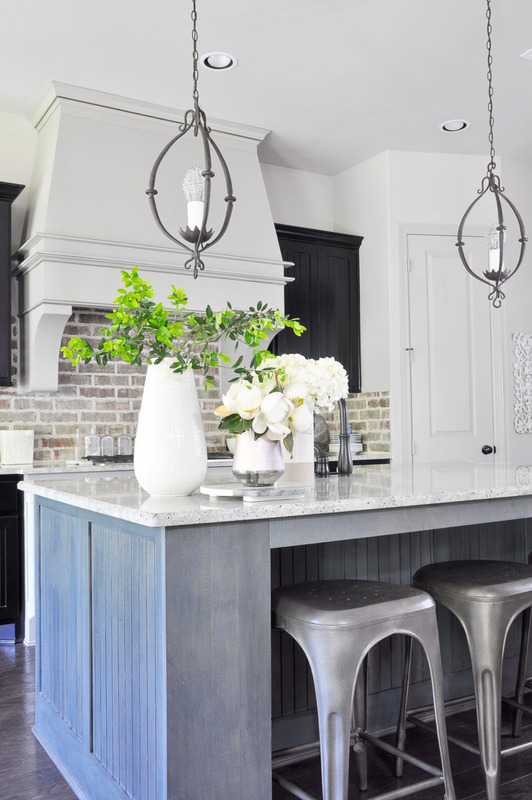 I adore the pendants over the island. Are they one of a kinds or do you have a source for them? Hello Mae, they are by Aidan Gray, but unfortunately they are discontinued. I will be replacing them soon and they may be for sale on my Shop page. Great post! I’m dealing with this now! Our new home is really throwing me for a loop! It’s a challenge to say the least, but your posts help keep me focused. Can you tell me what rug you have in your space? The off white one? It doesn’t look like the PB Dalton in Ivory. We had that in our old house and it looked much more yellow to me than what is in the photo. Thanks! Thank you! Yes, I have the exact rug linked and it’s definitely cream colored, not yellow though. Sometimes dye lots change, so perhaps it’s more white now than when you had it. It has held up very well for 4 years. Hope this helps!